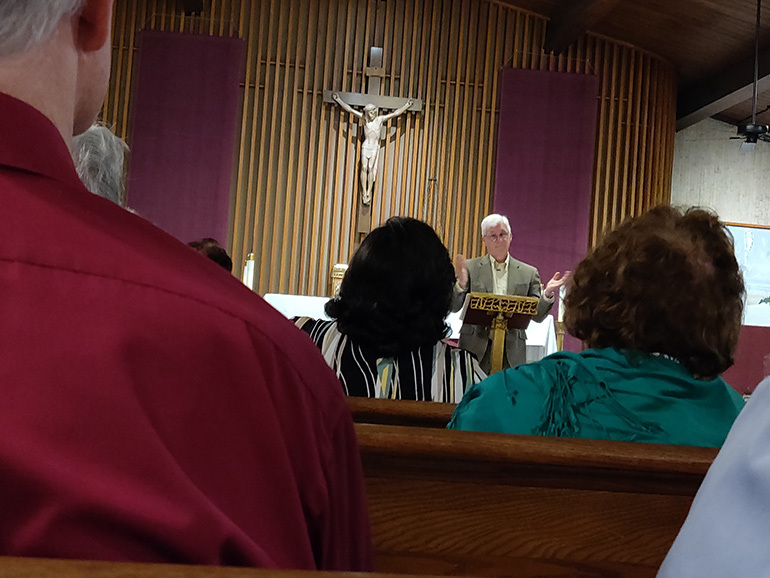 Ralph Martin speaks about the "new evangelization" at St. Augustine Church and Catholic Student Center in Coral Gables, March 21, 2019. His sense of urgency for the new evangelization even gained the Vatican’s notice. Pope Emeritus Benedict XVI appointed him as a consultor to the Pontifical Council for the Promotion of the New Evangelization in 2011. A year later, he was appointed as an expert for the World Synod of Bishops on the New Evangelization. Though Martin is well-versed in systematic theology — he is a professor at Sacred Heart Seminary in Detroit — he delivered his talk at St. Augustine March 21 in a way that those without a degree could understand. The content came from the Catechism of the Catholic Church, but he broke it down in practical ways. 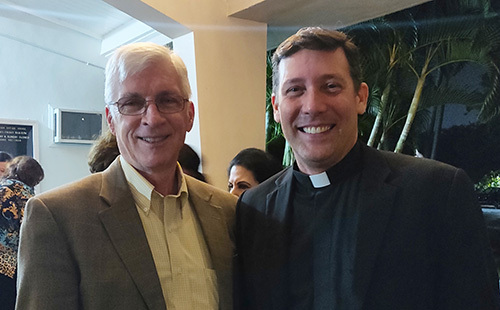 Ralph Martin, center, poses with his former student, Father Richard Vigoa, temporary administrator of St. Augustine Church and Catholic Student Center in Coral Gables, after giving a talk about the "new evangelization," March 21, 2019. Martin quoted Pope St. John Paul II’s definition of the new evangelization in Redemptoris Missio, then went on to explain that it’s all about conversion. “Sometimes people come to church regularly or are active in their parish but are not converted. They haven’t reached the heart of things,” he said. Conversion, he added, is a complete and sincere adherence to Christ and his Gospel through faith. He cautioned against the idolatry of creating a god after our own image, picking and choosing what we want Jesus to say or think. But Jesus can’t be separated from his Gospel and teachings. Martin briefly described a society awash in Catholic morality and culture. Faith was once received by osmosis and practiced in daily life. Entire towns or communities were practicing Catholics. But Catholic culture has weakened significantly in modern times. Now, natural communities are breaking down, and an electronic culture of distraction has taken over. The need to re-encounter Christ has been emphasized by 20th- and 21st-century popes because they recognized the laity’s need for a relationship with Christ in an increasingly pagan culture. Where evangelization was once directed toward far off nations through missionary religious orders, the new evangelization is directed at the baptized. The mission field is now our own communities and parishes. He pointed out the reality that many baptized Catholics have drifted away from the Church or are living a lifestyle not in accord with the Gospel. The new evangelization is also a mission given to lay people as well as priests and religious. It aims to awaken the baptized to who they are, who they were created to be and what their mission is. The goal is to equip parishioners to become leaders in their communities and reach out to their peers. Witness through your life: Live out your Catholicism at work through honesty and integrity; and through family life, especially by having children in a culture that does not welcome them. Witness through works of mercy, acts of charity and helping people in need. Help renew the temporal order: Be good citizens, participate in the political process, show concern for the common good and an interest in peace, justice and environmental stewardship.